The Golden temple is located in the holy city of the Sikhs, Amritsar. The Golden temple is famous for its full golden dome; it is one of the most sacred pilgrim spots for Sikhs. Although there are a number of Sikh shrines in and around Amritsar, Golden Temple is the biggest of all tourist attractions in Amritsar. The shrine houses the holy script of the Guru Granth Sahib and draws its name from the gold-laden dome upon a marble base. Inside lies the holy lake. Do cover your head with a handkerchief or a scarf before entering the Gurudwara.The Mandir is built on a 67-ft square of marble and is a two storied structure. Maharaja Ranjit Singh had the upper half of the building built with approximately 400 kg of gold leaf. The Golden Temple is surrounded by a number of other famous temples like the Durgiana Temple. The fourth Guru of Sikhs, Guru Ram Das, who had initially constructed a pool here, founded Amritsar, which houses the Golden Temple or Harmandir Sahib. It is here that Sage Valmiki wrote the epic, Ramayana. Rama and Sita are believed to have spent their fourteen-year exile in Amritsar, the epicenter of Sikhism. To the south of the temple are a garden, and the tower of Baba Atal. The Central Sikh Museum is atop the Clock Tower. The ‘Guru Ka Langar’ offers free food to around 20,000 people every day. The number shoots up to 100,000 on special occasions. A visitor must cover his / her head before entering the temple premises. 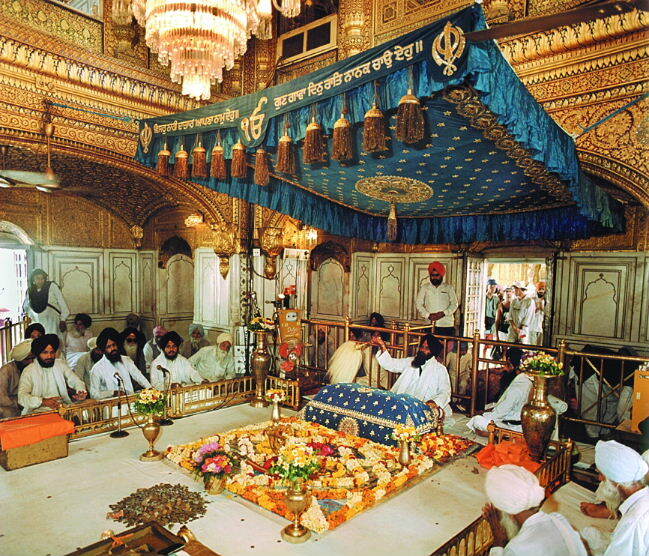 The Granth Sahib is kept in the Temple during the day and is kept in the Akal Takht or Eternal Throne in the night. The Akal Takht also houses the ancient weapons used by the Sikh warriors. Guru Hargobind established it. The rugged old Jubi Tree in the North West corner of the compound is believed to possess special powers. It was planted 450 years ago, by the Golden Temple’s first high priest, Baba Buddha. Guru-ka-Langar or the communal canteen is towards the eastern entrance of the temple complex, and it provides free food to all visitors, regardless of colour, creed, caste or gender. Visitors to the Golden Temple must remove their shoes and cover their heads before entering the temple. The temple is less crowded in the early mornings on weekends. As a site of spirituality and discovery, the stunning and peaceful Golden Temple India in Amritsar represents one of the most culturally significant shrines for the Sikh religion. Also known as the Harmandir Sahib, people from all over the world come to pay their reverence to this magnificent Sikhism temple and take a dip in the Amrit Saras Kund (Pool of Immortality). Founded by Guru Ramdas, the fourth Guru of the Sikh faith, the Golden temple Amritsar is one of the oldest established Sikh temples in India. As a landmark, the Harmandir Sahib is set amongst a spectacular backdrop. Positioned in the center of a serene lake, the richly ornamented structure is a stunning sight. The exterior is immediately noticeable for its golden gilded appearance and ornate marble work making it the most recognizable Sikh temple in India. The Golden Temple India is reached by a sole causeway that juts out from the shore of the lake. Marking the entrance to the temple at the beginning of the causeway is the mighty Darshani Deorhi Arch. Although surrounded by water, reflecting Sikh tradition and culture, the Golden temple Amritsar has 4 entrances. The concept is intended to reflect acceptance and openness, and to invite all travelers no matter what race or religion into the temple complex. Anyone can enter the Golden temple India, although visitors must follow religious protocol and dress appropriately. Everyone must cover their head as a sign of respect and take off their foot wear. At the entrance headscarves are provided for this purpose. Conveniently there is a visitor’s information office located here. Inside, various shrines to past Sikh Gurus and saints adorn the Sikhism temple complex. There is also a central museum. Throughout the interior, memorial plaques and commemorative inscriptions record historical events important to the Sikh faith. In tribute to the many Sikh soldiers who fought during both World Wars a number of memorials honour the fallen. Much of the construction of the Harmandir Sahib was overseen by the Sikh Emperor Ranjit Singh. Head of the Sikh Empire of Punjab, the emperor was a recognised patron, donating much of his wealth as well as building materials, toward the construction of the Amritsar Sikhism temple. He is still remembered today with much affection by the Sikh community for his contribution toward the Golden temple India and other sacred sites. The Takht Sri Hazur Sahib and the Takht Sri Patna Sahib mark two other famous achievements. However, it is the Harmandir Sahib Sikh temple in India that remains the greatest. Although stunning on a sunny day, at night the Golden temple Amritsar is lit up in spectacular style like a glowing amber beacon. A walk along the banks of the lake allows you to take in the beautiful setting. It is also a chance to stumble across the bathing rituals of the Sikh faithful who cleanse their soul by immersing themselves in the sacred waters of the lake throughout the day and evening. 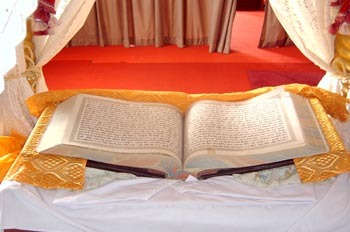 Housed within the temple, lies the sacred Sikh scripture, the Adi Grantha. The document is a collection of Sikh poems, prayers and hymns compiled by the various Sikh Gurus who have reigned over the past centuries. The hymns in particular, are brought to life throughout the day with a devote of musicians who provide an enchanting sound track as visitors amble leisurely around the marbled concourse surrounding the central temple. Many come to the Golden temple Amritsar looking for spiritual enlightenment and having found nirvana leave filled with power and energy. As a tourist site, Amritsar contains immeasurable peacefulness and harmony. The beautiful setting, cultural significance and spectacular presentation of the Harmandir Shaib makes this perhaps the most visited and famous temple in India. The Golden temple is located in the holy city of the Sikhs, Amritsar. Its nice place to visit.